lin,dib and da zimmm X3. one of my old photos . 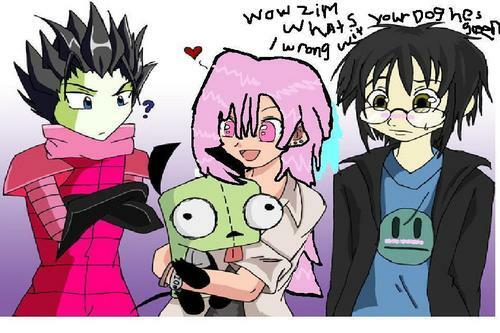 HD Wallpaper and background images in the Invader Zim FanCharacters club. This Invader Zim FanCharacters fan art contains anime, comic book, manga, and cartoon. She makes me think of Effie Trinket. Pink hair and an overly happy expression! Well, I must say I really don't appreciate this - considering the fact that this is MY picture. This is GuardianAngel07 from deviantART speaking, and I would like you to remove my picture from this site completely. I'm not happy that you took this drawing of mine without my permission and then decided to color over my OC on top of that. I will continue to ask you to remove my drawing until you do so. Please NEVER do this again. This is considered art theft. Now please remove my drawing. Ah, I see. Thank you very much for informing me. oh im so sorry i ment to give you credit but i dont know who drew it! im sorry about that i make my own drawings now but im sorry about that. big fat apligies. please forgive me.